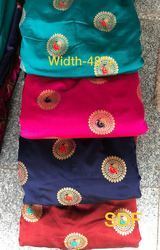 We are a leading Manufacturer of jacquard fabric from Surat, India. We are offering Banarasi Jacquard Fabric to our patrons. Offered range is accredited for its beautiful patterns and intricate designs that are used in stitching of trendy attires as per market trends. To meet the exact requirements of our clients, we also offer these fabrics in multifarious customized specifications. Manufactured using of 60% wool and 40% other fibers, these can be availed in various colors, patterns and other specifications.